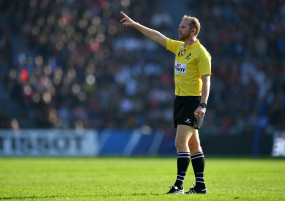 European Professional Club Rugby has named the match officials for the semifinals of the Heineken Cup and the Challenge Cup. Jérôme Garcès and Wayne Barnes have been appointed to the Heineken Champions Cup semifinals, Nigel Owens and Johnny Lacey to the Challenge Cup semifinals. The Heineken Cup semifinals will take place on 20 and 21 April 2019, the Challenge Cup semifinals on 20 April 2019. The appointments are made by EPCR's referees' selection committee, chaired by former Test referee Joël Jutge of France. Television match official: Rowan Kitt (England). Television match official: Olly Hodges (Ireland).